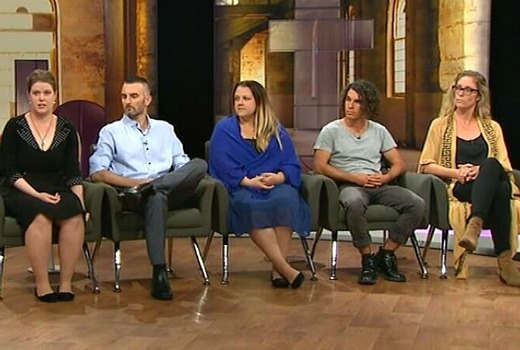 The good work of SBS series First Contact has left a sour taste after the failure of the broadcaster to adequately explain the glaring absence of a participant in its Insight forum. Yesterday SBS issued a Press Release talking up the ratings for the show stating they were “beyond delighted” with the results. “Over the past three days, First Contact has truly shone a light on the divide between Indigenous and non-Indigenous people in Australia. SBS and the program’s producers Blackfella Films are beyond delighted that so many Australians have come together to engage in debate and discussion about an issue that effects all of us,” said SBS Director of Television, Tony Iffland. But nowhere in the Release was there any explanation for Sandy’s absence from the Insight special, despite her featuring prominently in pre-publicity for the show. Her absence -after quitting the series half way through its run- was dismissed with a single line by host Stan Grant with the words “Sandy couldn’t be here tonight.” And that was that…. There was no further context on her absence. No opportunity for Indigenous members of the community to confront her on her opinions. No sign of any of the tweets by viewers asking where she was and barely any discussion by the remaining 5 about undertaking the journey with her. What did they feel when she quit the series? More importantly, her absence left us wondering what had Sandy actually learned? Had she mellowed her views since the series? If the premise of the show was that Australians with ignorant and racist views should reconsider their position, in Sandy’s case it was a fail. Yes, probably one self-inflicted. Sandy may well have had a perfectly acceptable personal reason -illness, a death in the family, overseas travel- for being absent. It’s not the real issue here. The issue is the way SBS has handled this, by failing to adequately explain her absence to its audience. Producers, sitting in the audience, shed no light on these questions. No pre-recorded interview as a substitute. Not even Ray Martin was there to explain any of it (although he has since told us more about her initial exit in the press). These were disappointing omissions. Yesterday an SBS spokesperson was unable to shed any more light on Sandy’s absence, telling TV Tonight, “She wasn’t able to make it. SBS appears to have forgotten they invited the audience to go on a journey with them, and that this genre requires everyone to be honest about the immersive experience. If you promote a show with such strong language you owe it to your audience, and the community at its centre, to please explain. Storytelling 101. When SBS had to pull Once Upon a Time in Punchbowl after producers had been misled by a participant, it was upfront that the doco did not meet standards and it went back to the drawing board. In 2011 Go Back to Where You Came From’s stubborn Raquel stuck with the immersive experience against her instincts, copping a barrage of public backlash for her opinions but still fronted for a forum to indicate significant change. By contrast, 2014’s elephant in the room has upstaged the important Indigenous debates the show so passionately sought to address. Next time SBS offers us a show of this nature the audience would be well within its rights to ask if it’s worth investing in the show or whether they too are simply, unable to make it. I would have liked more follow up of some sort too, but I’d also like them respecting the participants to not turn it into too much of a reality-drama that just distresses them (not to say that’s the only possibility here though). Hey David, this is not your best article, sorry but it is not. I understand all your frustrations and that Sandy should be able (unlikely though) to justify her views and held to account. However though, to me and many others who have made comments the real story is the plight of the indigenous people of our nation. The bloke who drives and gets put in jail, the bloke who finds a bit of respite from lifes pressures, when he is put in jail, the woman who feels proud to be an aussie when she is overseas, but not when she is at home. This is one occasion when we all need to step back, forget about the white folk and focus on the original aussies and what we can all do. I don’t view it as an either / or situation. I watched 3 episodes highlighting the Indigenous issues which the show did admirably (see review). These will continue to resonate with any thinking viewer who invested in the show. You will notice the article here is far more critical of the broadcaster’s lack of transparency for Insight than the individual concerned, who may well have had a valid reason for not appearing. SBS asked its audience to go along with an immersive experience then was very selective in its post-show discussion, avoiding the elephant in the room in its Press Release on Friday. Badly handled. That said, I have no problem with opinions that disagree. We can all look at the same thing from different angles. You are of course correct David. But I am speculating just as you are. Thing can happen on a friday that are hard to correct, or clarify. We’re dealing with real people here, not professional entertainers. You may well be correct but I think you’re judgement is premature. You can’t force someone against their will to stay on a program. If you’re getting caught up on the appearance or otherwise of one of the participants, you’re missing the entire point of the show. It’s not to laugh at or criticise the participants’ opinions – it’s to have our views challenged by their experiences. It’s not Big Brother – we don’t need to know how someone felt in the house. It’s about your views and how they were challenged. Sandy doesn’t need to be there for that. David, I disagree with the stance you’re taking. Sandy was the most ignorant and the most racist of the participants, and I never need to see her again. As part of the audience, I don’t feel let down at all. Fairfax carried an article which quotes Ray Martin saying “They had all been told they could leave as long as they told the producers. She just went.” Can’t argue with that. As for not turning up for ‘Insight’. Well, she’s 6 months on from the filming, who knows where her divorce is at; and having seen the opprobrium thrown her way, possibly decided that she wasn’t up for any more. Compared to the plight of Indigenous people in this country, it’s a complete non-issue. Billy yesterday SBS could have provided more detail but chose not to elaborate. The words “unforseen family emergency” would have been better than “wasn’t able to make it” especially when you are sending out a Press Release the next day. Even in your scenario the forum still gave us no insight has to her quitting mid series. It was almost like she had never existed, despite her being such a talking point and featuring in pre-publicity. Too many unanswered qs. I was really looking forward to the insight special, but felt let down afterwards. It was more of an interview then a discussion or debate like usual insight episodes. For such an important subject, the discussions from First Contact should have continued into this forum, but the 6 participants looked bored as hell. A lost opportunity from the momentum gained throughout First Contact. This is speculation though. What if she said no ten minutes before the show and didn’t give them an explanation. What is revealing why she couldn’t be there would breach her privacy? Let’s say for example there was a death in the family. They can’t announce that on national television until all members of the family have been informed. I don’t know what happened but none of us do. I think the judgement is a bit harsh without any facts. Simply not good enough explanation. Really poor form and a wasted opportunity for a more worthy participant to learn from the experience and contribute their thoughts/ideas to the forum. By saying very little SBS seem to be respecting Sandy’s privacy. But they also allow us to speculate- my guess is that behind the scenes there have been some fairly frank discussions about contracts & obligations. Why do we need to know? Let’s just focus on those who did fully embrace the experience. If sandy is so racist that she wasn’t able to continue, why should SBS be expected to make her into a pariah for the sake of publicity? Perhaps they felt the real outcomes of this social experiment could be best served by not including sandy. David, I think you’re being far too harsh on SBS based on what we know about the Sandy situation. Yes they should have been far more transparent about why Sandy wasn’t present (ie; provide a reason) apart from saying “She couldn’t make it”. However if the reason Sandy gave wasn’t specific (ie; she simply stated she couldn’t make it) than that’s not the fault of SBS that Sandy wasn’t upfront with them. Jeff: Television is made where producers have relationships in place with talent, backed up with contracts about their obligations. You may accept that producers simply said “Oh ok” when told “Sorry I’m busy,” but I don’t. More dialogue and negotiation would and should have taken place. I again come back to a lack of adequately explaining the process to the audience in a genre which was all about being real about the immersive experience and barely discussing 1 of 6 participants in the show’s post-forum (including shunning such tweets by the audience who had invested in the show). I concur with your sentence they should have been more transparent. The same thing happened earlier this year in Living With the Enemy when the Australian guy pulled out of their half of the deal in the Middle Eastern episode.